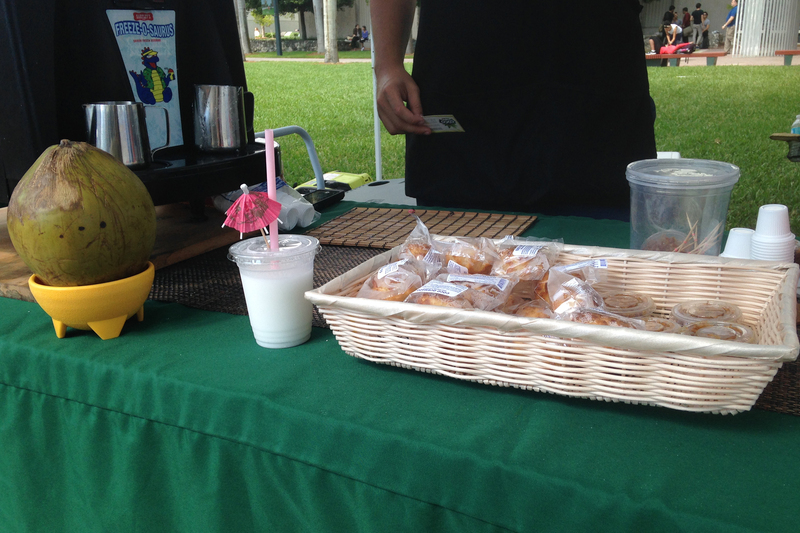 The promise of the American Dream and Miami as hub for diversity make the University of Miami an ideal business climate for Alonso Marquez and his Venezuelan coconut shake business, Cocomarket. Marquez sells shakes Wednesdays at UM’s Farmer’s Market. He started the business from the ground up when he moved to the U.S. five months ago to leave the political turmoil in Venezuela. Upon his arrival on Sept. 1, he began to learn English. He later met with his uncle, Jesus Loreto, who jokingly suggested that they sell traditional coconut shakes like Dr. Coconut, the business Marquez’s father runs back in Venezuela. Marquez, however, decided to take this joke seriously. On Oct. 17, the uncle and nephew began Cocomarket. The presence of Venezuelan culture in Miami provided a niche audience that helped them start their business in the U.S., then allowing customers from other backgrounds to become exposed to the product. The two began selling their shakes in places like Lincoln Road and Miami Springs. The Wednesday Farmer’s Market on campus especially became a favorite location. Other locations see tourists come in and out, Marquez explained, but the customers at the university remain consistent, allowing them to build a loyal customer base and brand name. When using credit or debit cards, sellers can see whether or not a customer has made a purchase from them before, allowing them to keep an eye on customer loyalty. Using this method of monitoring, Marquez said that roughly one-third of customers return, and he expects that figure to increase. Sophomore Daija Boyd frequents the Wednesday market to “get a taste of the local palate of the city.” She says she has a tendency to return to favorite stands. To entice new customers, Cocomarket hands out free samples, a technique that junior Monique Edwards said works well. UM is the stepping stone to Marquez’s larger aspirations. Once his brand is established in the Miami area, he hopes to distribute his product across the country, moving from south to north. Marquez’s first goal is to move from Farmer’s Market stands to a store. From there, he hopes to secure an industrial building where shakes can be manufactured in bottles on a larger scale. He would like to see his product distributed to big names like Publix, Wal-Mart and Whole Foods. Marquez also hopes to drive around the beach selling his shakes. But instead of using a food truck, he envisions using a “shake trailer.” Customers would be attracted to his non-traditional method of marketing a traditional product, he added. The most important aspect of his product, according to Marquez, is that it is naturally replenishing.